Dean Alfred Mathewson with (left to right) Sonia Gipson Rankin, ABA President Paulette Brown, Aja Brooks ('08) and Professor Sherri Burr. 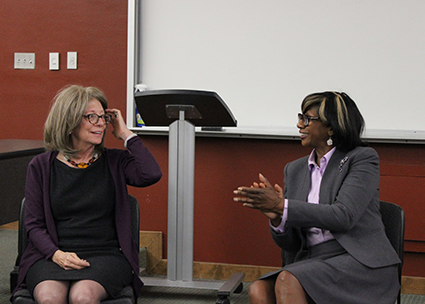 Two women who broke the gender barrier in the legal field came for a historic visit to the UNM Law School on Monday, April 25. Paulette Brown, President of the American Bar Association, is the first woman of color to lead the ABA in the association’s 136-year history. Roberta Cooper Ramo was the first woman to lead the ABA as president (from 1995-96) and currently is president of the American Law Institute. She is the first woman to hold that position as well. 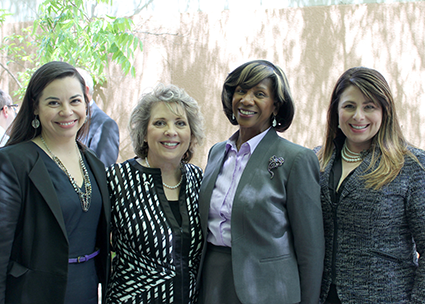 ABA President Paulette Brown (2nd from right) with (left to right) Allison Block-Chavez ('14), ABA Secretary Mary Torres ('92) and Amber Macias-Mayo ('14). 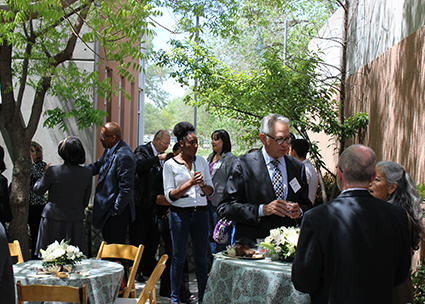 A luncheon was held in the Hart Wing, when students, faculty as well as local diversity leaders were able to meet with Brown. After the luncheon, ABA Young Lawyer’s Division Chair Spencer Edelman moderated a fireside chat open to the law community. 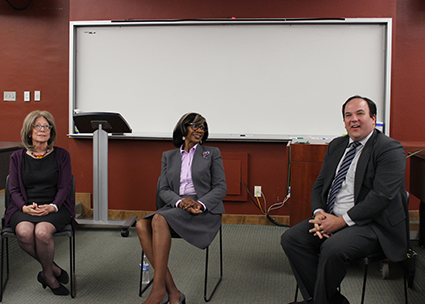 Brown and Ramo answered questions about diversity and inclusion in the legal field and discussed implicit bias, biased behavior that we may not initially recognize in ourselves. They discussed the importance of being aware of implicit bias in working towards inclusion. Both discussed their respective paths leading to their ABA presidencies, the role of the ABA, and mentoring. ABA Secretary Mary Torres (‘92), the first Hispanic woman to be elected as an ABA officer, and Orlando Lucero, member of the ABA Board of Governors, coordinated Brown’s visit to New Mexico. 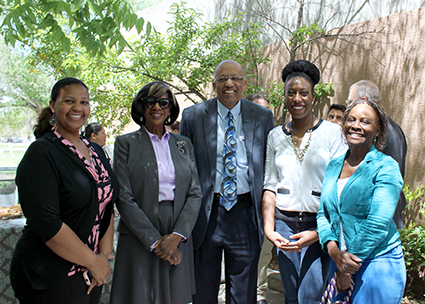 Brown also attended the Swearing In Ceremony for recent inductees into the New Mexico Bar and visited the Boys and Girls Club in Albuquerque. 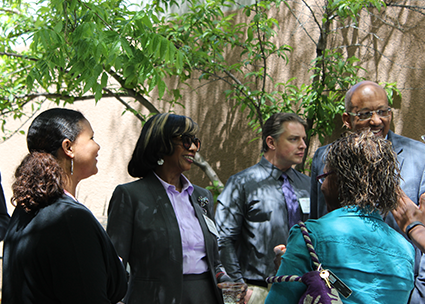 UNM law students, faculty as well as local diversity leaders attended the outdoor luncheon. Attendees were anxious to meet Brown, who seemed to enjoy her visit. After the luncheon, ABA Young Lawyer’s Division Chair Spencer Edelman moderated a fireside chat with Brown and Ramos in a classroom. Brown and Ramo shared their thoughts on topics including diversity, implicit bias, the role of the ABA, and mentoring.